JR Industries Ltd is Europeꞌs leading manufacturer of Roller Shutters for Commercial Vehicles, based in Caerphilly, South Wales, UK. Founded in 1970, JR Industries specialized in roller shutters for the commercial vehicle industry and entered into a partnership with the renowned manufacturer Whiting in the USA. This spurred the development of the company on, and with taking over Henderson Mobile, further roller shutter types were added to the existing product range. JR grew to be one of the leading manufacturers in the UK. For 10 years active in the French market with its own subsidiary, the brand awareness and market shares of JR Industries grew steadily. Even if 2008 was an economically challenging year, the roller shutter business was extracted from the company Ross and Bonymann (formerly Windsor) and transferred into the portfolio of JR.
2010: The economy was back on course for growth. Europe is among the most demanding markets in the global competition. For rising to this challenge with a new achievement potential, the RSD Komponenten GmbH in Bielefeld and JR Industries Ltd in South Wales established the new company JR Industries GmbH based in Bielefeld. 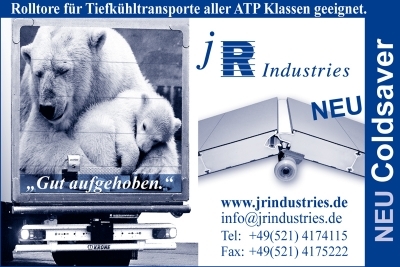 Managing Director and shareholder of the JR Industries GmbH is Moritz Fuess. The RSD Komponenten GmbH, founded in 2004 and supplier of a well-known aluminium roller shutter with continuous hinge and testing according to EN 12642 XL, was able to extend its manufacturing by further roller shutter types of JR Industries with this merger. Today, we are able to offer a full product range and can serve a significantly larger customer clientele. Further capital investments are planned for 2012 in order to carry innovative products and competitive cost structures into both established and new markets. A first step was done at the end of 2011 with redesigning the insulated roller shutter "Coldsaver", with a successful ATP certification by the TÜV Munich. The roller shutter stands out for its straight-lined design of even panel optics with a double-walled aluminium finish coat and a panel thickness of 60 mm. Injuries are avoided by the integrated anti-finger-trap. The requirements of the refrigerated logistics were met by optimizing the running performance, by exchangeable roller holders with eccentric sleeves and by using high-quality materials.